Tilapia is a mild-tasting, freshwater fish that provides us with a host of vitamins and nutrients: selenium, phosphorous, and off the charts in B1 and Vitamin D; it also provides Omega 3 essential fatty acid (EFA), but not nearly as much as salmon. Soak tilapia in fresh lime juice for about 20 minutes. Then, in a heavy bottomed skillet, add 1 tablespoon oil and bring to medium heat; place fish in pan and let cook for about 8 minutes; flip and cook another 4-8 minutes until fish is done in the middle. Pour warm avocado sauce over fish, top with pico de gallo and enjoy! 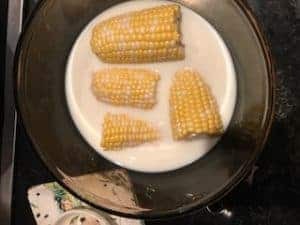 In a big bowl, soak corn in milk. WHAT? MILK??? Yes! The sugars in the milk permeate the corn kernels, resulting in a caramelized roasted corn. 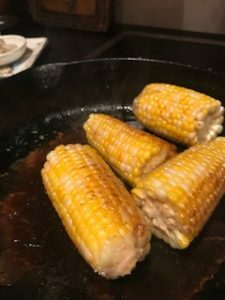 Heat a heavy bottomed (cast iron) skillet on medium high heat, put the corn in the skillet and let it roast; turn the corn to make sure all of the kernels are roasted. Then, stand the corn on end and using a sharp knife, slice off the roasted kernels. In a food processor, puree avocado with oil, onion and garlic; chill and serve as a dressing or warm and serve as a sauce. Light creamy avocado sauce works well as a salad dressing or an accent for fish!